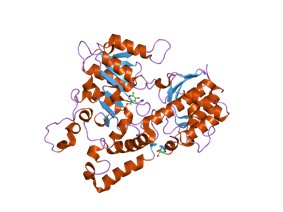 Crystal structure of Homo sapiens kynureninase. PDB rendering based on 3e9k. 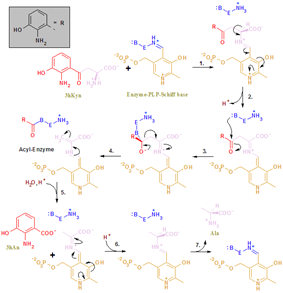 Kynureninase or L-Kynurenine hydrolase (KYNU) (EC 3.7.1.3) is a PLP dependent enzyme that catalyses the cleavage of kynurenine (Kyn) into anthranilic acid (Ant). It can also act on 3hKyn (to produce 3hAnt) and some other (3-arylcarbonyl)-alanines. Humans express one kynureninase enzyme that is encoded by the KYNU gene located on chromosome 2. KYNU is part of the pathway for the catabolism of Trp and the biosynthesis of NAD cofactors from tryptophan (Trp). 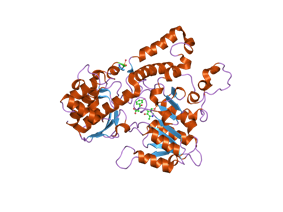 Kynureninase belongs to the class V group of aspartate aminotransferase superfamily of structurally homologous pyridoxal 5'-phosphate (PLP) dependent enzymes. 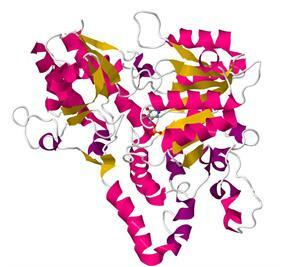 To date, two structures of human kynureninase have determined by X-ray diffraction with resolutions of 2.0 and 1.7 Å. Forty percent of the amino acids are arranged in an alpha helical and twelve percent are arranged in beta sheets. Docking of the kynurenine substrate into the active site suggests that Asn-333 and His-102 are involved in substrate binding. In KYNU reaction, PLP facilitates Cβ-Cγ bond cleavage. The reaction follows the same steps as the transamination reaction but does not hydrolyze the tautomerized Schiff base. The proposed reaction mechanism involves an attack of an enzyme nucleophile on the carbonyl carbon (Cγ) of the tautomerized 3hKyn-PLP Schiff base. This is followed by Cβ-Cγ bond cleavage to generate an acyl-enzyme intermediate together with a tautomerized Ala-PLP adduct. Hydrolysis of the acyl-enzyme then yields 3hAnt. ^ a b c ​; Lima S, Khristoforov R, Momany C, Phillips RS (March 2007). "Crystal structure of Homo sapiens kynureninase". Biochemistry 46 (10): 2735–44. ^ Alberati-Giani D, Buchli R, Malherbe P, Broger C, Lang G, Köhler C, Lahm HW, Cesura AM (July 1996). "Isolation and expression of a cDNA clone encoding human kynureninase". Eur. J. Biochem. 239 (2): 460–8. ^ Toma S, Nakamura M, Toné S, Okuno E, Kido R, Breton J, Avanzi N, Cozzi L, Speciale C, Mostardini M, Gatti S, Benatti L (May 1997). "Cloning and recombinant expression of rat and human kynureninase". FEBS Lett. 408 (1): 5–10. ^ ​; Lima S, Kumar S, Gawandi V, Momany C, Phillips RS (January 2009). "Crystal structure of the Homo sapiens kynureninase-3-hydroxyhippuric acid inhibitor complex: insights into the molecular basis of kynureninase substrate specificity". J. Med. Chem. 52 (2): 389–96. Lima S, Khristoforov R, Momany C, Phillips RS (2007). "Crystal structure of Homo sapiens kynureninase". Biochemistry 46: 2735–2744. Heyes MP, Chen CY, Major EO, Saito K (1997). "Different kynurenine pathway enzymes limit quinolinic acid formation by various human cell types.". Biochem. J. 326 (2): 351–6. Rose JE, Behm FM, Drgon T, et al. "Personalized smoking cessation: interactions between nicotine dose, dependence and quit-success genotype score.". Mol. Med. 16 (7-8): 247–53. Zhang Y, Zhang KX, He X, et al. (2005). "[A polymorphism of kynureninase gene in a hypertensive candidate chromosomal region is associated with essential hypertension]". Zhonghua Xin Xue Guan Bing Za Zhi 33 (7): 588–91. Inada J, Okuno E, Kimura M, Kido R (1984). "Intracellular localization and characterization of 3-hydroxykynureninase in human liver.". Int. J. Biochem. 16 (6): 623–8. Ubbink JB, Vermaak WJ, Bissbort SH (1991). "High-performance liquid chromatographic assay of human lymphocyte kynureninase activity levels.". J. Chromatogr. 566 (2): 369–75. Magni G, Amici A, Emanuelli M, et al. (2004). "Enzymology of NAD+ homeostasis in man.". Cell. Mol. Life Sci. 61 (1): 19–34. Strausberg RL, Feingold EA, Grouse LH, et al. (2002). "Generation and initial analysis of more than 15,000 full-length human and mouse cDNA sequences.". Proc. Natl. Acad. Sci. U.S.A. 99 (26): 16899–903. Christensen M, Duno M, Lund AM, et al. (2007). "Xanthurenic aciduria due to a mutation in KYNU encoding kynureninase.". J. Inherit. Metab. Dis. 30 (2): 248–55. Walsh HA, Botting NP (2002). "Purification and biochemical characterization of some of the properties of recombinant human kynureninase.". Eur. J. Biochem. 269 (8): 2069–74.